You can check out the full article below. 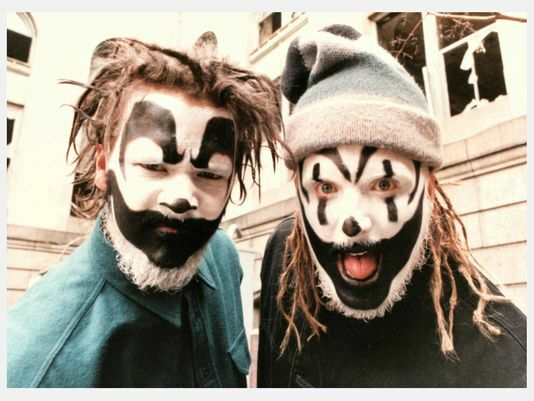 In the Insane Clown Posse’s long, winding and grease-painted history, its third album “Riddle Box” marked a turning point, when the horror-rap harlequins began their transition from regional sensation to nationally infamous Faygo-swilling duo. Now, in celebration of the album’s 20-year anniversary, ICP is turning the crank on “Riddle Box” once again. “The Great Milenko,” released in 1997, made headlines for the group when it was banned by Disney, and 2009’s “Bang! Pow! Boom!” (and its science- and magnets-questioning centerpiece “Miracles”) made ICP Internet-famous. But for many Juggalos, the group’s dedicated army of fans, the 1995 release is the thrill ride that marked the entry point into the group’s Dark Carnival worldview. The album is being re-released Friday in a deluxe box set that includes a remastered version of the CD, an extra disc of “oddities” from the “Riddle Box” era (including bonus tracks, instrumentals and a long lost voicemail message from producer Mike E. Clark) and a booklet where the Clowns share stories about every track on the album. In an era of streaming music, digital tracks and declining sales, box sets are antiquated relics of the record industry’s plush days. But ICP’s fans still crave physical product, J says. “Riddle Box” followed the group’s first two “Joker’s Card” albums, 1992’s “Carnival of Carnage” and 1994’s “Ringmaster,” which made enough noise in Detroit and the surrounding area to earn the attention of Jive Records. The group had signed a deal with Jive, who initially wanted to release an EP from the Clowns but later ordered a full album. ICP, who were living in an apartment building on Prentis in the Cass Corridor at the time, used their advance check from Jive and purchased three converted cargo vans that they wrapped in “Riddle Box” decals and used as promo vehicles. They drove them down to Dallas and set up camp there for a month, handing out sampler CDs at area high schools and record stores, mirroring the promotional tactics they had employed in Detroit. “And next thing you know, we had a little bit of a spark in Dallas,” J says. He laughs when comparing the promotional grind of the ’90s to the social media-centric strategies of today. “Riddle Box” also marked a new peak for the group in Detroit: It was the first time ICP earned radio play in their hometown, when the humorously gruesome “Dead Body Man” became a fixture on WHYT-FM (96.3). ICP performed “Riddle Box” live in its entirety for the first time at Saint Andrew’s Hall in February 2013, and plans to perform the album front-to-back during a month long tour in May. Prior to that tour, the group will host its annual Big Ballas Christmas Party at the Crofoot in Pontiac on Dec. 18, and the Juggalo Weekend celebration will take place Feb. 19-20 at Saint Andrew’s Hall and Harpo’s in Detroit. While planning a series of reissues — a 20th anniversary edition of “The Great Milenko” is planned for 2017, and a commemorative edition of “The Amazing Jeckel Brothers” will follow in 2019 — ICP continues to focus on the present. The group released two albums this year, and J and Shaggy are plotting solo releases for 2016.